The accomodation, 85 mq, with separate entrance, is composed of a large kitchen, a bedroom with a double bed and balcony, a bedroom with a double bed (or two separate beds), a bathroom with shower, a storage room and a nice garret (suitable for living room). The accommodation provides four beds, but exceptionally can use the sofa bed in the loft for two additional people. The property offers: kitchen, refrigerator, oven, TV with satellite, cd-dvd, washing machine, ironing board, vacuum cleaner, hair dryer antenna. Warming and hot water are controlled by a indipendent gas boiler The house is surrounded by a garden. The part in front of the largest housing is reserved for people who occupy it, the stone barbecue, located in the part of the garden reserved for the owners, can be used after agreement with the owners. There is a private parking. The cottage consists of three apartments, a tavern and a wine cellar. Two apartments are available for guests. It's an old mountain style home, renovated keeping the original features of the house: stone walls, roof stone named 'lose', wise use of wood and the recovery of ancient objects: locks, antique wooden feeders, scales and other items of peasant art, today, finished their season of work, adorn the walls of the house. We are the couple who will host you during your stay at the Maison de Thoules. Paola is a professor of literature and a violinist. Giuliano is an engineer and deals with the ski resorts in the region. We also have a beautiful daughter named Cecilia. We love to travel and it was during one of our trips we came up with the idea to open our home to those who, like us, love to discover different places, meet people and have new experiences. We offer our guests the same warm welcome and given that we love to provide our friends. You are free to manage your time as best believe it, but you can still count on us to make the best use of resources, routes and beauty of our valley. Toules is a place of passage. Long ago the farmers were going to Toules in spring and autumn according to the rhythms of vertical transhumance typical of Valle d'Aosta : in the stables in winter and in summer at low altitudes in mountain pastures. Today it is still the case. For more than a century, the Maison de Thoules was used as a barn and stable. Two modest rooms were used as dormitory and kitchen. Then for a long period, the house was uninhabited. Since 2000, Mario and Elvira, the parents of Paola, with perseverance and dedication have been working to revive the home. Without haste, and with the support of the whole family, the house has taken shape. In 2006 it was opened to accommodate those who want to stay there. The hut is now composed of three rooms, a tavern and a wine cellar. Two apartments are available to guests. A house lives if is inhabited : we strive to care for and beautify it in every season. It's our place of rest and recreation. We hope that it is also for you. 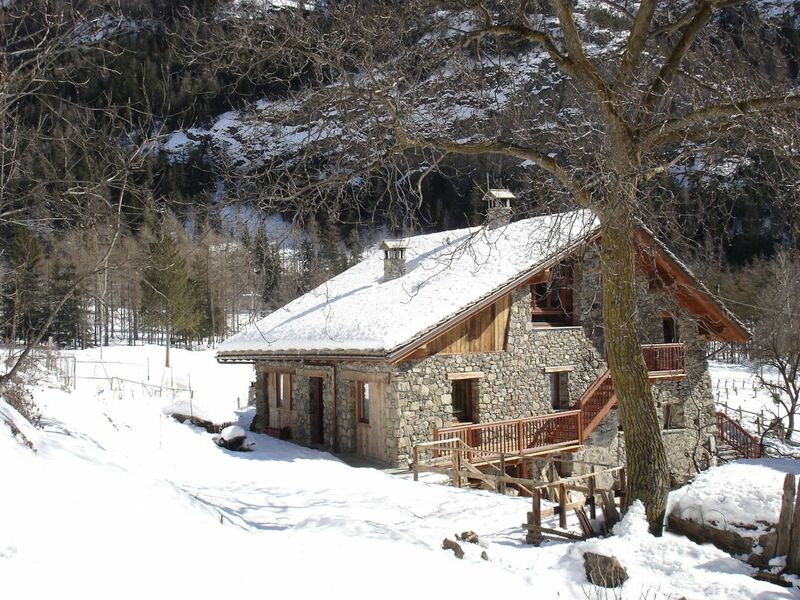 The accommodation has been refurbished in the Aosta Valley style. We kept the stone, we have recovered items of daily use, such as the manger, the cross of wood, old wood, the cast iron stove, mixing them with modern elements. The house is so cozy and functional. Merci! Vous accueillir chez nous a été un plaisir. Aurevoir à Thoules! Precioso apartamento con entrada privada, con todas las comodidades, camas muy cómodas, cocina completa, una estancia perfecta en un sitio precioso. Muy buena ubicación para conocer gran parte del Valle de Aosta. Los dueños muy amables y simpáticos, ofreciendo su ayuda si era necesario. Una estancia perfecta,altamente recomendable. Muchas gracias Paola, Elvira y Mario por todo. Grazie a voi! Ci ha fatto molto piacere ospitarvi e speriamo di potervi accogliere ancora nella nostra casa! Bellissima vacanza in un vero paradiso e con tanta neve. Paola, il papà Mario e Giuliano sempre gentili e disponibili. Appartamento super organizzato con tutti i confort e location ideale per momenti di assoluto relax in mezzo alla natura ai piedi del bosco e della montagna. Rispecchia fedelmente le note inserite nella descrizione inserzione. Noi ci siamo trovati benissimo e lo consigliamo assolutamente. La nostra vacanza è stata apprezzata da tutti...due adulti, due bambini e due cani....di sicuro ritorneremo nel periodo estivo....e grazie ancora! Vi ringraziamo per la vostra cortesia! Ospitarvi è stato un piacere e ci auguriamo davvero di potervi accogliere ancora a Thoules in futuro. Ho recentemente soggiornato presso l'appartamento più grande di questa bellissima Maison. La Casa è perfettamente fedele alla descrizione, dotazione e qualità degli arredi ottima, deliziosi il soppalco, ottimo per rilassarsi la sera, e il giardino. Disponibilità e cortesia massima della Signora Paola e del papà per venire incontro alle ns. esigenze, anche se relativamente poche vista la completezza di ogni confort. Giudizio finale, una esperienza consigliabile a tutti e, sicuramente per noi, da ripetere. Vi ringrazio molto per la vostra recensione, ci auguriamo di avervi ancora nostri graditi ospiti! The Valpelline is the paradise for ski-touring, but just a few minutes from the house there are three ski areas: ease of paths make it ideal for those who want to start any kind of skiing. For downhill skiing, in twenty minutes you can reach Crevacol, ideal for families, and the cable-car that from Aosta reaches Pila. A small ski lift, with attached snow park for children, is located in Ollomont.